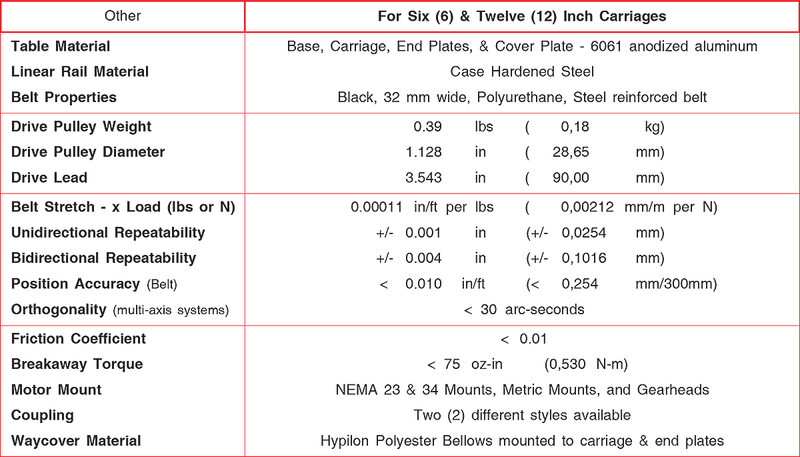 The Lintech 180 series linear tables are designed to handle large loads at very high speeds. These linear stages use a low friction, preloaded, recirculating linear ball bearing system, which ride on precision ground linear profile rails. The linear square rails are mounted to an extruded aluminum base, which offers a rigid support over the entire travel of the table's carriage. The load is mounted to a precision machined aluminum carriage, which has threaded stainless steel inserts for high strength and wear life. The drive system uses two pulleys, along with a high strength, steel reinforced polyurethane belt, which provides 3.543 inches (90 mm) of linear movement per revolution of the input shaft. NEMA 23 & 34 motor mounts, or gearhead mounts are available as well as planetary gearheads.